Is buying pet insurance a good idea? Steven Rowell, V83, an assistant professor emeritus at Cummings School, responds to a reader’s question about pet insurance. Q: I just adopted a new dog. Is buying pet insurance a good idea? What does it cover? A: Many pet owners end up having to spend a large sum of money because of an unexpected health crisis. And euthanasia for financial reasons is all too common in veterinary practice. 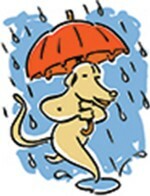 Pet insurance can make the difference between being able to go ahead with treatment or not. If you have a young, healthy pet and plan to treat it like a family member, pet insurance is a smart way to help control costs over its lifetime. However, if you are looking to buy insurance for an older pet, many companies will look at the animal’s medical history very carefully to exclude preexisting conditions. This can make it difficult to find adequate, affordable coverage. What pet insurance covers depends on the plan you purchase—and you get what you pay for. Some plans will help you with reimbursements toward wellness visits, plus costs associated with accidents or illness. Or you can buy a plan geared more toward providing catastrophic coverage. The monthly premium will be based on your pet’s age, medical history and breed, as well as the cost of veterinary services in your area. Pet insurance usually doesn’t cover 100 percent of veterinary costs. Typically, there’s an annual or per-medical-incident deductible, and you may be required to pay a certain percentage of costs. With most plans, you pay the entire bill upfront and then receive reimbursement after you submit a claim. However, your veterinary hospital may be able to bill the insurer directly, so be sure to do your research if that’s important to you. The American Veterinary Medical Association lists pet insurance providers at avma.org/public/petcare/pages/pet-insurance.aspx. Please email your questions for “Ask the Vet” to Genevieve Rajewski, Editor, cummings Veterinary Medicine, at genevieve.rajewski@tufts.edu. Because of the volume of inquiries, we cannot respond to all questions submitted. For any pet health issue, owners should contact their veterinarian.